Summer's too short to spend it shaving! It's the ultimate spruce when you've got time on your hands and will leave you with a super smooth feeling. Enriched with Essential Oils known for their benefits to the skin and delicately fragranced with Floral Vanilla, Veet Oriental Wax leaves your skin soft and touchably smooth for up to four weeks. Just warm the pot and spread evenly for the perfect result, working on hair as short as 5mm and normal skin. 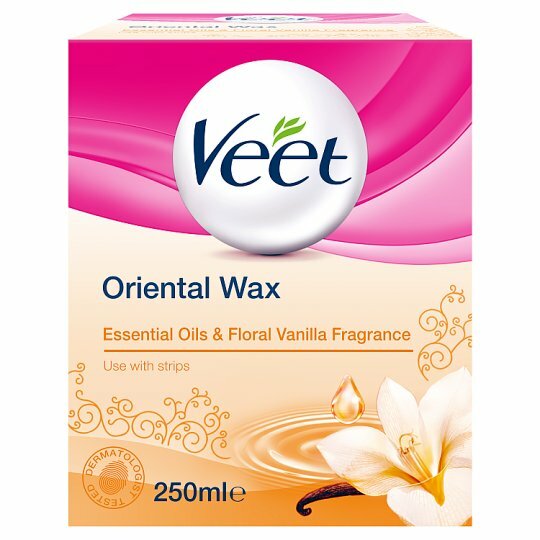 Veet Oriental Wax is inspired from ancestral oriental wax recipes to give you high quality hair removal at home with an effective sugar formula. Includes precision spatula with temperature indicator. Sufficient for up to three depilations of both half legs. Contains: Sugar (85%) and Essential Oils. PRECAUTIONS OVERHEATED WAX CAN CAUSE BURNS. Follow the directions for use and the precautions indicated on the leaflet inside the pack. Designed for use on legs, underarms, bikini line, arms and upper lip but not suitable for use on the face, head, breast, perianal or genital areas or any other body parts. Do not use on varicose veins, scars, moles, broken, irritated, sunburnt skin, or on skin that has reacted badly to waxes in the past. Check with your doctor before using if you are on any medication which can affect the skin or if you suffer from any skin related disorder. Waxing is not suitable for the elderly and diabetics. Before every use, TEST YOUR SKIN REACTION by applying the wax to a small part of the area you wish to treat, following the directions for use. If after 24 HOURS there is no adverse reaction, begin waxing. KEEP OUT OF REACH OF CHILDREN. In case of ingestion, consult a doctor immediately and show the outer pack. Waxing is suitable for pregnant women but may cause bruising. It is normal that your skin turns red after waxing.